The Custom Electronics Design & Installation Association (CEDIA) Asia Pacific have introduced an all new logo for their annual CEDIA Expo in July. Comfort Heat range of direct heating systems will provide a comfortable warmth to those cold floor surfaces in new and renovated bathrooms, kitchens and living areas. Hyundai Construction Equipment Australia (HCEA) are a model example of an organisation poised to prosper during the 2009 period. ITK have recently completed a promotional trade display for Akubra hats. Trimble have announced that they have been selected by the National Development and Reform Commission to supply Global Navigation Satellite System Continuous Operating Reference Station receivers. 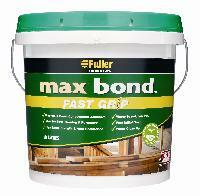 The Max Bond Fast Grip family, which consists of a 420g cartridge and a 600 mL sausage, has been joined by a 10L pail. A hand-picked selection of commercial projects in the news this week.